Winery Guild gives above average boost to the trade in region. Its value is higher in summer, the peak grape-harvesting season. If you have an inn in the town common folk also will be overjoyed tasting their local sorts of wine sometimes becoming heavily addicted. Winery Guild were established to encourage the development of technical and professional understanding and increased knowledge of wine throughout all areas of the wine production. 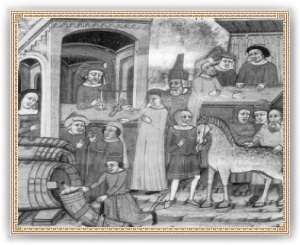 In medieval Europe, Church was a staunch supporter of wine which was necessary for the celebration of Mass. In places such as Germany, beer was banned and considered pagan and barbaric while wine consumption was viewed as civilized and a sign of conversion. Wine was so revered and its effect so feared that elaborate theories were developed which gemstone-cups would best counteract its negative side effects.